The Parashakthi (Eternal Mother) Temple, located in Pontiac, Michigan, north of Detroit, sees itself as a place of worship for people of all faiths who wish to pay respect to the female aspect of the divine. 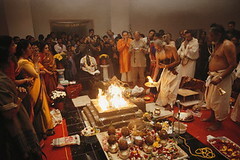 Thus, the goals of the temple are: to have a place where all people regardless of their faith are able to worship the Divine Mother; to reach out and contribute to various humanitarian causes as the need arises in the community and the world; and to create a center for spiritual learning and exchange of ideas on spirituality. The founder of the temple is Dr. G. Krishna Kumar. Others involved at the very beginning include Dr. Kristen Kesky and Dr. Peter DeRidder. Five spiritual preceptors, including Guruji Dr. V.V. Swarnavenkatesa Deekshitar, were of great assistance. Construction the Eternal Mother Temple began in May, 1999, and worship began on October 19, 1999. Once the temple is completed, it will be of classic south Indian design. It will have in addition to the main temple area, a kitchen, meeting rooms, auditorium, cafeteria, and a residence for the priest and guests. In addition, the hope is that there will be facilities for religious education, along with assistance and shelters for abused or battered individuals. The considerations for selecting the site for the temple were spiritually based, and related to Hindu beliefs about the Divine Mother. The site itself, originally a sacred space for Native Americans, is believed to contain a wealth of spiritual energy. The land had never been touched by development, and so was in a pristine state. The site is filled with trees, shrubs, and has a stream on the south side. It is a natural habitat to many species of birds and other animals. It was here that the Divine Mother, appearing to Dr. Kumar in a vision during Kundalini yoga in 1995, indicated that she wanted a temple to be built. 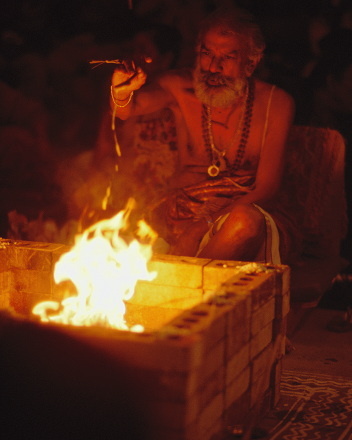 Because he did not recognize the particular form of Parashakthi-Devi Durga immediately, Dr. Kumar called in five Hindu spiritual preceptors to determine if his vision was correct. Once he understood the meaning of the vision and aware of the Temple in Thiruverkadu in Chennai, Dr. Kumar began to dedicate his life to the construction of the temple in Pontiac. Located on 16 acres of land in a middle-class neighborhood in the middle of suburban Pontiac, north of Detroit, the city has welcomed the new religious center. 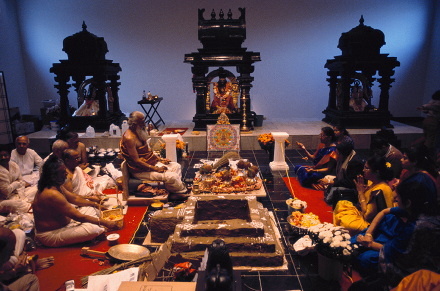 The majority of those who participate in the temple’s services are of Indian descent, however a number of Americans of European descent are members and have played an important role in the life of the temple, as members of the Board of Directors. Prior to the opening of this temple, many of the members attended the Bharatiya Temple in Troy, Michigan. Many still divide their time between the two places.